Thank you so much girl! This photo was taken with film in Gatlinburg, TN after a snow. It was freezing cold and I was shooting with Fujifilm. Fujifilm deepens greens and blues…so the blues were so vivid in this photo! Hugs!!! Thank you! Hope you have had a great weekend! A cool pic on a hot day. Gorgeous. Petra, those were my exact thoughts -- something cool for a hot day! :-) Thank you so much! Gorgeous shot!! Thank you, Benita! I feel ten degrees cooler just looking at this! Thank you so much! I needed some relief myself…thus, Gatlinburg, TN in the middle of winter! :-) Hugs!! We honeymooned in Gatlinburg! I love following the river all the way up towards Asheville and the beautiful boulders in the water. Is it the French Broad River? Or does that not start until you reach NC? 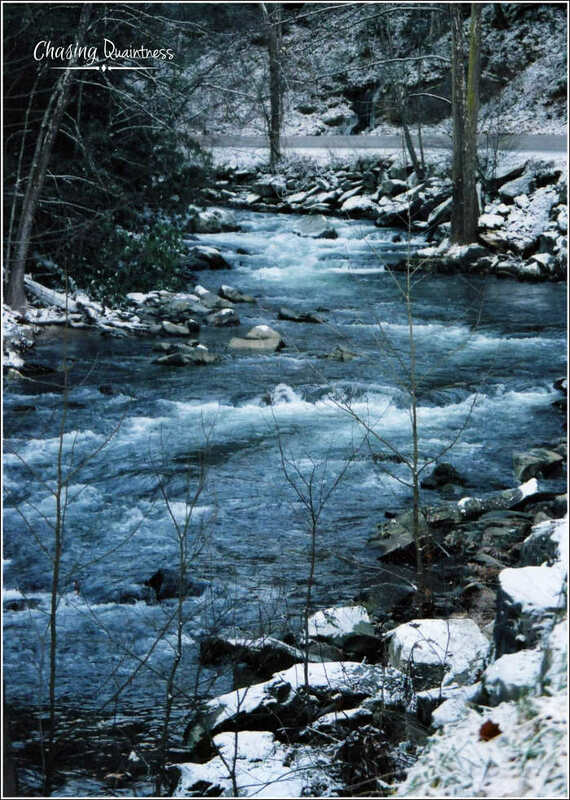 I love Gatlinburg during the winter…it is one of my most favorite places. I’m not sure…this part was on the way to Cade’s Cove.